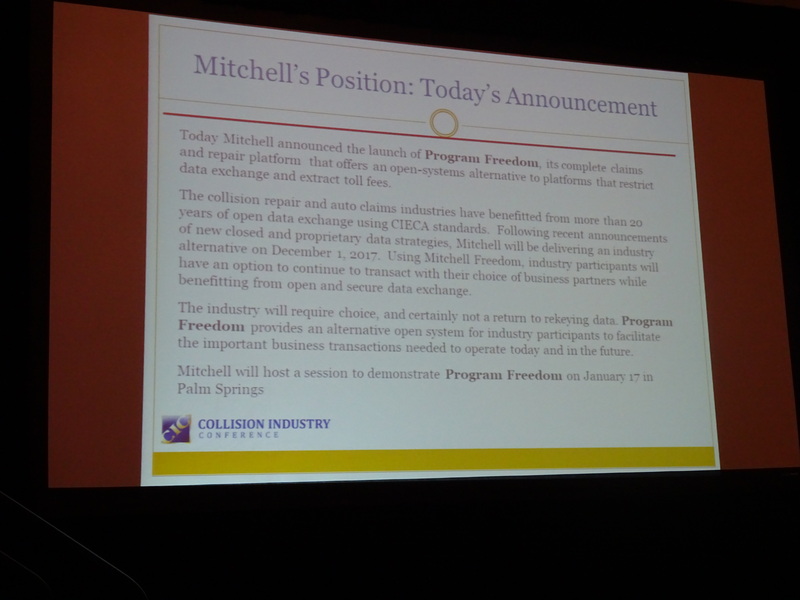 Mitchell on Tuesday announced it would provide collision repairers a free option to export Business Message Specification messages to business partners starting Dec. 1, and a Collision Industry Conference data access task force said Audatex had committed to deliver the same by April 2018. At least one representative from Audatex (and AudaExplore) owner Solera had originally been scheduled for the Collision Industry Conference discussion of CCC Secure Share but was unable to attend. However, CIC Open Systems, Data Access and Sharing Task Force Co-Chairman Mark Algie (3M), who is familiar with AudaExplore’s position through his work on the task force, discussed the company’s plans on its behalf. 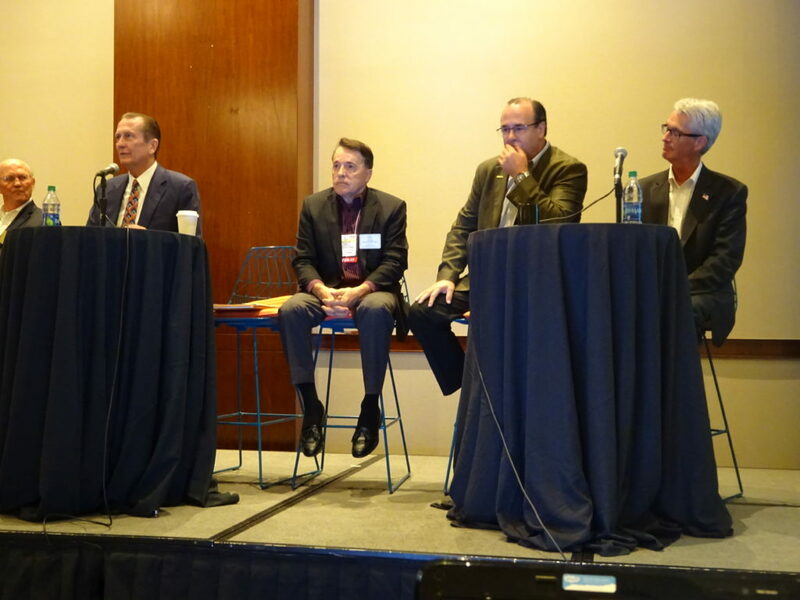 Both Mitchell and Audatex will continue to support the Estimate Management Standard indefinitely, Mitchell repair sales and service Vice President Jack Rozint and Algie confirmed Tuesday at CIC. Task force Co-Chairman Dan Risley (ASA) said earlier Audatex would have its BMS program in place for April 2018. CCC Secure Share goes live April 4, 2018. The Collision Industry Electronic Commerce Association has urged the industry to shift to the modern BMS data standard instead of the obsolete EMS. The neutral inter-industry organization created the two formats to provide a common language for collision repairers’ software to “talk” to the software used by business partners like rental car agencies and parts providers. BMS, which uses a modern XML format, allows a collision repairer to transmit to a business partner only the estimate information needed by that particular industry. EMS, which uses archaic formats like dBase IV, effectively sends all of the information from an estimate over to the recipient unless the collision repairer takes steps to customize its delivery. (Learn from the Society of Collision Repair Specialists how to do that on all Big 3 Estimating Systems here.) CIECA hasn’t supported EMS since 2003 but issues regular updates to BMS — and yet, EMS continues to linger in the industry. This creates not only structural IT inefficiency but also the potentially greater concern that anyone with an EMS file can learn all kinds of things about the customer and your business that you most likely don’t want them knowing — or don’t even realize they’re getting. SCRS, which has also advocated for the industry to switch formats, has argued that prolonged use of EMS could lead to a scenario where shop estimate information is obtained by a “data pump” and sold off to companies reporting vehicle collision histories. As was observed during the CIC presentation, neither BMS nor EMS files are generated encrypted. However, the BMS standard does make it easier for a shop to transmit only certain information rather than the whole estimate, and its XML format is perhaps more conveniently encrypted. CCC has revised its system to transmit both BMS and EMS messages and will ultimately drop support for EMS in 2018. A shop will designate through an “app store” which BMS-capable companies registered with CCC will receive which messages. CCC will serve as the switchboard for encrypting and transmitting those files instead of the shop and vendor communicating externally through an upload or data pump. This creates greater security, eliminates an IT hassle for shop business partners, and instantly grants a participating vendor access to 19,000 new customers. Despite an initial fear that both would follow CCC’s lead, Mitchell and Audatex are formally offering an alternative ahead of the April changeover. Algie couldn’t provide much information about Audatex’s plans beyond what we’ve mentioned above, but Mitchell and Rozint provided fairly extensive detail into the Project Freedom framework. Otherwise, “there will be no transaction fees,” Rozint said, aside from an instance where Mitchell helped customize integration for a client at the server level. 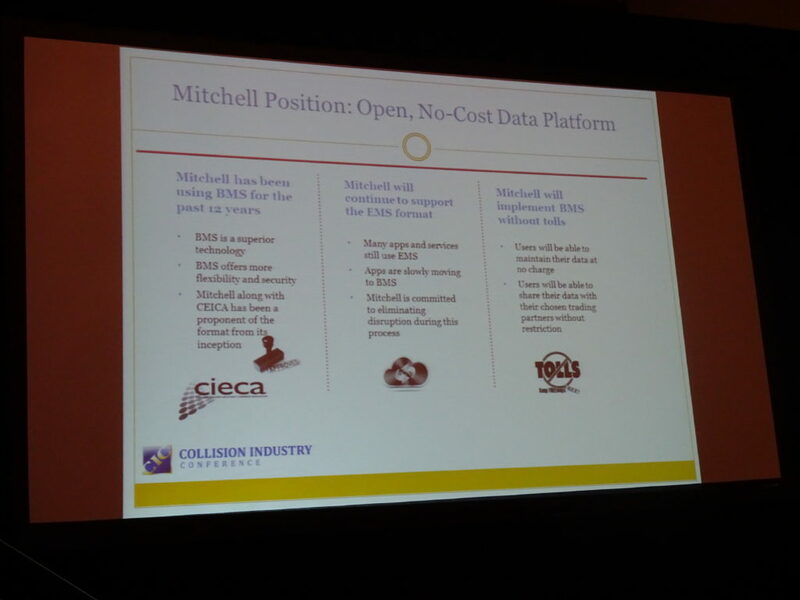 According to Mitchell, auto body shops will be able to choose “which data fields are shared with each partner,” though it’s unclear if this applies to EMS estimates as well as the BMS ones. “We’re not going to control that decision,” Rozint said. A shop could choose to give the entire estimate to a rental car provider rather than the fields designated as rental car industry-specific, he said. 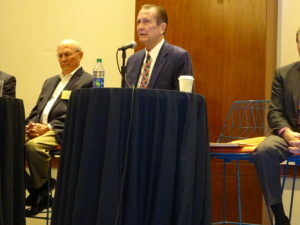 Rozint also observed that “the fifty cents is one issue,” referring to CCC’s $0.50-per-repair-0rder charge to vendors for Secure Share, but the “complete visibility” CCC would have into the marketplace — which competitors were doing well, and who’s doing business with whom — would be potentially a larger issue. Asked why Mitchell wouldn’t have the same visibility into transactions shared through its system, Rozint said “we’re going to offer the choice.” A shop could take their data, “go behind your curtain” and share it with whomever it wanted through external means without the IP knowing the recipient, he said.